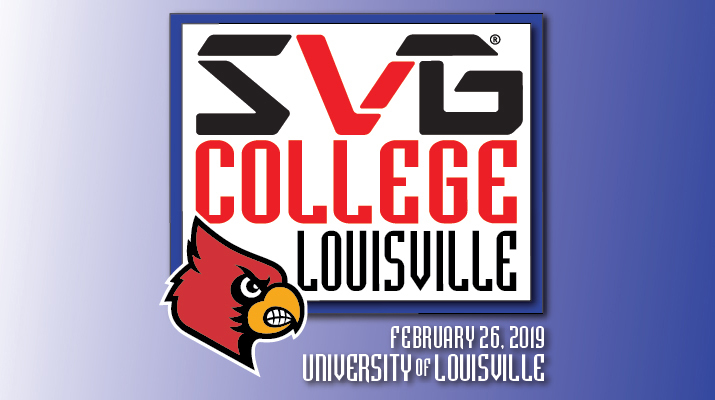 The latest in the SVG College Regional Event Series takes us to Louisville, KY and the campus of the University of Louisville on February 26 for SVG College: Louisville. Network with and learn from some of the top college-sports-video content creators in the local area, tour the Cardinals’ new $8 million, 7,850-sq.-ft. broadcast center designed for the upcoming launch of the ACC Network, and become a part of the SVG College family at this intimate professional networking event. Attendance to SVG’s College Initiative events are open to College Initiative sponsors and qualified members. Please contact Rob Payne or Andrew Gabel with any questions about joining the College Initiative. This is event is open to SVG members, including all college sports production professionals, local broadcast and regional Networks, Professional Sports Leagues & Associations, and Professional Teams Personnel. Take advantage of this exclusive opportunity! RSVP: Click HERE to register. The SVG College Regional Event Series is a recurring series of half-day programs hosted on various campuses across the country that have demonstrated a commitment to and the investment in live video production. The gatherings are designed to bring together content creators and production-technology specialists with some of the industry’s top technology vendors to discuss best practices for those at all levels of production expertise. Seasoned veterans share their experiences and help guide those looking to dive headfirst into the exciting world of video production in college athletics.